Lupus, also known as systemic lupus erythematosus or SLE, is an autoimmune disease that can affect almost any part of the body, but most commonly the skin, joints, kidneys, lung, brain—and the heart. People with lupus often experience a premature increase in atherosclerosis, the hardening of the arteries that produces CAD. Consequently, CAD is often seen in people with lupus at a relatively young age. The increased risk of premature CAD with lupus is greatest in young women. There seem to be two major reasons that lupus increases the risk of CAD. First, those with lupus tend to have more of the traditional cardiac risk factors: obesity, sedentary lifestyle, hypertension, increased cholesterol levels, and metabolic syndrome. These risk factors are more prevalent in people with lupus because the disease itself often enforces a relatively sedentary lifestyle, and possibly because steroids are so often necessary in the treatment of lupus. Second, lupus increases the inflammation that occurs in blood vessels, and inflammation in blood vessels is the main driver both of atherosclerosis itself, and of the rupture of atherosclerotic plaques. The prevention of CAD, the diagnosis of CAD, and the treatment of CAD in people with lupus are the same as in anyone else. However, since the prevalence of CAD, especially in younger people, is substantially higher in lupus, it is important for those who have lupus (and their doctors) to be on the lookout for symptoms suggestive of CAD. Lupus is associated with heart valve disease. The generalized inflammation associated with lupus can cause various products of inflammation (which some doctors refer to as “grunge”) to be deposited on the heart valves. These inflammatory products, which include components of blood clots, immune complexes, and inflammatory cells, can form "vegetations," which are wart-like growths on the valves. These vegetations (which are much more prevalent on the mitral valve than on the other heart valves) often do not cause any obvious cardiac problems. However, in some people with lupus the vegetations can become large enough to produce mitral regurgitation, leading to heart failure; they may become infected, leading to endocarditis; or they may trigger blood clot formation, leading to stroke. If vegetations become large enough to produce a heart murmur in a person with lupus (which is common), an echocardiogram can help to assess the size of the vegetations. If they are large enough, or if they show substantial growth over time, antibiotic prophylaxis to prevent endocarditis may be prescribed. In some cases, blood thinners may be recommended to reduce the risk of stroke. Pericardial effusion and pericarditis are common in people with lupus. Pericardial effusions may be seen in as many as 50 percent of people who have lupus at some point during the course of their illness. Fortunately, these pericardial effusions typically do not produce symptoms, and they often are discovered incidentally, when performing an echocardiogram for some other reason. Specific treatment for these effusions is usually not necessary, and pericardial effusions that are not causing symptoms usually resolve on their own. In addition to pericardial effusions however, pericarditis (inflammation of the pericardial lining) can also be seen in people with lupus. When pericarditis is present, that is usually a good indication that the lupus is in an active phase, that is, it is also producing problems involving other organ systems. The pericarditis usually subsides as the generalized lupus flare is treated and brought under control. If specific treatment is needed, the pericarditis of lupus usually responds to treatment with non-steroidal anti-inflammatory drugs (NSAIDs). Myocarditis—inflammation of the heart muscle—is, fortunately, uncommon in people with lupus. Lupus myocarditis rarely produces direct symptoms, but it can eventually lead to weakening and dilation of the heart, and eventually to heart failure and cardiac arrhythmias. If so, all the symptoms of heart failure can develop. Myocarditis in people with lupus is usually diagnosed after an enlarged heart is seen on a chest x-ray or an echocardiogram, but it also may be suspected if unexplained tachycardia (fast heart rate) at rest is noticed. Similar to pericarditis, myocarditis is often seen when the lupus is in a generally active phase, typically involving several organ systems. 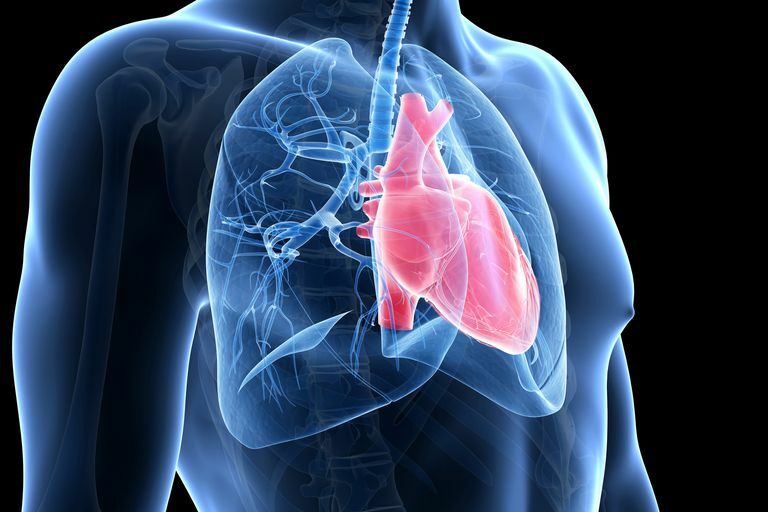 Improvement in cardiac function has been seen in some patients with lupus myocarditis when they are aggressively treated for active lupus, using steroids and immunosuppressant drugs. After an episode of lupus myocarditis, various types of heart block may occur. Usually, these episodes of heart block are relatively benign and self-limited and generally do not require the use of a pacemaker. In addition, chronic resting tachycardia may be seen in people who have lupus. This tachycardia may produce palpitations, and is most commonly seen in people whose lupus is currently in an active phase. For people with lupus, there is a 50-50 chance that some type of cardiac involvement will eventually occur. They and their doctors should be alert to symptoms that might indicate heart problems, especially chest discomfort and shortness of breath, and should be quick to pursue the possibility of heart disease if symptoms appear. Doria A, Iaccarino L, Sarzi-Puttini P, et al. Cardiac Involvement in Systemic Lupus Erythematosus. Lupus 2005; 14:683. Hak AE, Karlson EW, Feskanich D, et al. Systemic Lupus Erythematosus and the Risk of Cardiovascular Disease: results From the Nurses' Health Study. Arthritis Rheum 2009; 61:1396. Magder LS, Petri M. Incidence of and Risk Factors for Adverse Cardiovascular Events Among Patients with Systemic Lupus Erythematosus. Am J Epidemiol 2012; 176:708. Schattner A, Liang MH. The Cardiovascular Burden of Lupus: a Complex Challenge. Arch Intern Med 2003; 163:1507.